Chess fans worldwide have witnessed a very eventful and entertaining Round 7 on Saturday. Both top seeded teams and both world champions lost on the same day! Lots of great games to play through, right Mark? @MarkTWIC: “It’s 3am, time for bed. Goodnight all”. An hour later, in Tromsø … @chessninja: “So, woke up at 4am instead of 5am today. Not an improvement”. Talking about silly: @alinihatyazici: Humour in Tromso, Kasparov will offer draw to Fide President in FIDE elections! “No draw! Sofia rules!” is our answer”. Kasparov: “Kirsan is scaring away chess players”. Et cetera et cetera. Make up your own mind. Enough politics for now! If you want to read more about chess and politics, have a look at the A Tempo Magazin, or read my piece “The envelope and the orange cap” in this blog. Oh yes, they play chess! Let’s go concentrate on chess now, shall we? Good games coming up on Sunday! @Megalovic: “R8 high combined Elo Leko-Nakamura 5527 Ivanchuk-Topalov 5516 Shirov-Caruana 5510 MVL-Wojtaszek 5503 Predojevic-Carlsen 5481″. A particular match we should follow @EinarGausel? “China rating favorites on 3 out of 4 boards vs Azerbaijan in the open section today. Should be a good one.” But do they play in their best line-up? @GMjtis: “Today I am wondering about China’s missing men – does anyone know why Wang Hao and Bu Xiangxi are not in”. Ok let us have a look at the game. What do you think @TarjeiJS? Couldn’t believe the position after 12 moves on board 1 of Italy-Latvia. @PoisonedPwnPress: “Carlsen has conjured an advantage in the endgame, and his opponent is short on time”. I think have read that tweet somewhere before. Another exciting match @nvmea: “Russia – Spain is going crazy guys”. @PattyLlaneza: “Amusing how many Spanish fans are changing their tweets from “how could he miss that?” of some days ago to “go go go!! !” today :-)”. @PoisondPwnPress:” Kramnik played very aggressively against Vallejo, and his attacked fizzled. Dead lost down 3(!) pawns”. @Andika_Rudy: “What do GMs eat during games? Banana! Indeed, gedhang! Minions everywhere”. Again, hardly any tweets about the women’s section today. Let’s send @TarjeiJS over to have a look: “And the Russian women goes marching on. Already secured a 2,5-0,5 lead over Hungary, although they are in trouble on board 3”. Agreed. From +1.65 to -92.52 (according to the engines on the official website) in 10 moves is a convincing turnaround. But not only a young player like Shankland scores heavily inTromsø: we have an oldie but goodie playing for England on board one: @top40chess: “Today at the Chess Olympiad, Michael Adams pulled further ahead in the race for board 1 gold. He’s climbed from world #21 to world #14 so far!” @johnchess: “England lost to Serbia but Mickey Adams won again to maintain his place as best performer on board one”. Meanwhile, on the lower boards…. @thims1985: OFFICIAL: Surinam 3.5-0.5 Nigeria (female) Unacceptable!! And a remarkable tweet from @Tromso2014: “PRESS RELEASE: Five players and two officials from Burundi have vanished from the Chess Olympiad in Tromsø”. @PoisonedPwnPress: “Going into the last 3 rounds, teams with 12 points have realistic chances to medal, based on the previous 3 Olympiads.” @TarjeiJS: “With the 2-2 tie against Spain, we can already conclude that Russia will NOT win the Chess Olympiad”. Spain-RUS 2-2? What does Paco Vallejo have to say? @Chessidharta: “Un match fantástico hoy contra Rusia 2 a 2 en Tromso! Y una victoria increíble con negras contra Kramnik .” Muy feliz. Tomorrow is round 9 with a nice match: @gmjlh: “Norges andrelag mot Russland! @TarjeiJS: “When Russia is facing Norway 2 in the 9th round, it’s a clear sign that things are not quite according to the plan.” Anything else? 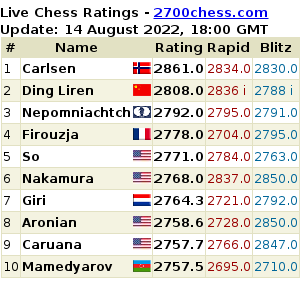 @Fantasy_Chess: “…and don’t forget the other big match up in Tromso tomorrow! Kirsan vs. Kasparov”. Your blogger wishes you a good night!